I set in type a list of crafting aims I wanted to get out of 2014 - things I wanted to achieve. Finish things. I still have lots of unfinished things. Don't think that ever gonna change. Finish the cardigan for N. I finished it but by the time I did it was far too small for Nat. So it was gifted to a friend. Cast on the gramps cardigan and finish it for N. This. Never. Happened. Aim to knit something for M. Neither did this. Knit matching hats for the boys for next winter! I started this. I made one hat. Which is too small. Ack well. Add some more to my Bella dia vintage stripe blanket. Well yes I did then I joined it to yet another failed blanket from the year. But this then did make one finished blanket. Continue this in the new year. Challenge myself with knitting. Try a new technique. Be brave. Well I started and finished a lace shawl which was my first lace attempt I enjoyed it. I still need to block it. I think trying new things scares me as I'm scared of failing. Being postive and recognising the things i CAN do and not focus on the things i CANNOT should be the key. Again something I'm always going to struggle with. 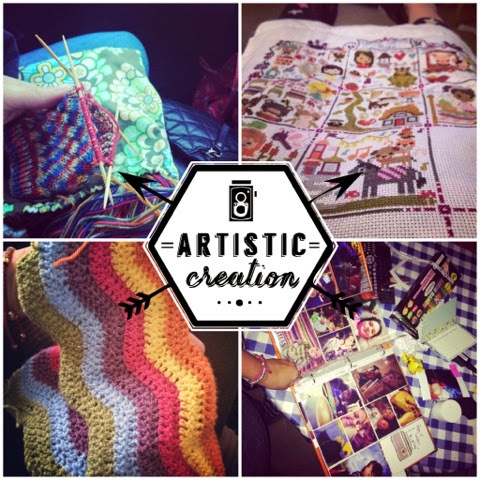 Try and meet new crafters and local to me. This ties in with my goal of being more social. I've made it back to my local crop a few times and have plans to try and attend more in 2015. Plus I've actually made it to knit night a couple of times!! I have no idea of the things I've actually completed in 2014. I don't keep count. But enjoy the process.